Located in the remote mountain region of southern Peru is a mysterious place revered by local Peruvians as 'The Place of the Gods'. 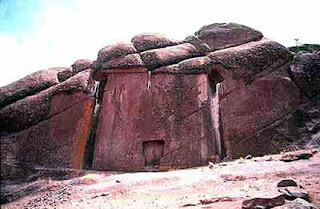 Known as the Doorway of Aramu Muru, it stands near the border with Bolivia on Lake Titicaca where Inca legend says life was first created on Earth. The doorway, a squarish stone cut-out in a flat, cliff outcropping, is surrounded by mystery. Hidden in a land full of Inca ceremonial chulpas and other rock-carved temples, the doorway is purported to be a passageway to another dimension. Locals have claimed that people have disappeared and reappeared near the door. Many refuse to get close to the door claiming it to be a portal for the ancient gods. Some have noted strange, tall men accompanied by glowing balls of lights and walking through the doorway. Some travelers have experienced falling throught the doorway and traveling to another dimension. One witness, Jerry Wills, said "My experience here has been fantastic! I believe I have actually been through the doorway, traveling into another dimension past the universe." "'I'm back...,' I quietly whispered. I felt it a struggle to move or speak. As I moved closer to my wife I heard her quietly sobbing. I moved closer. When asked if she was all right, I was told how she had seen me vanish. One moment I had been there and the next I seemed to fade away. 'Where were you? ', she asked, 'I was afraid you might not come back...' It was clear that she had been frightened by what she had seen. I tried to explain but couldn't relate my experiences to her. I needed time to think. I needed time to understand how to put into words what I had experienced." You can read more at Doorway to the Universe. No one really understands how to open this portal but it does seem to open if you approach it in the correct way. This is definitely on my future travel plans! Great place and few know about it! I want to visit it, just not sure how to get there. ...se observar bem...isso não é uma porta...olhem para cima na horizontal e verão que forma a figura de um astronauta deitado. Diante disso só restam 2 possibilidades; uma escultura em homenagem a alguem que teve uma grande importancia para o povo da época ou um tumulo que abriga os restos mortais dessa mesma pessoa!! I got goosebumps reading this awsome article. I would like to read more if you are willing to write more about this topic. The comment above from marta22pe says ".If you look closely ... this is not a door ... look up horizontally and see how the figure of a lying astronaut. Therefore they have only two possibilities; a sculpture in honor of someone who had a great importance for the people of the time or tomb that houses the remains of that person !!"